This panel is signed (perhaps by a later hand) 'de Heem', but its quality does not seem to match that of accepted original works. It comes closest to De Heem's work from around 1636, just as he left Holland for Antwerp. It is most likely to be a contemporary imitation, though it seems to be identifiable in the 1649 inventory of Charles I's collection where it is described as by 'de hem'. Depicted is a half-draped table with an over-turned glass besides a nautilus shell cup with silver gilt mounts. 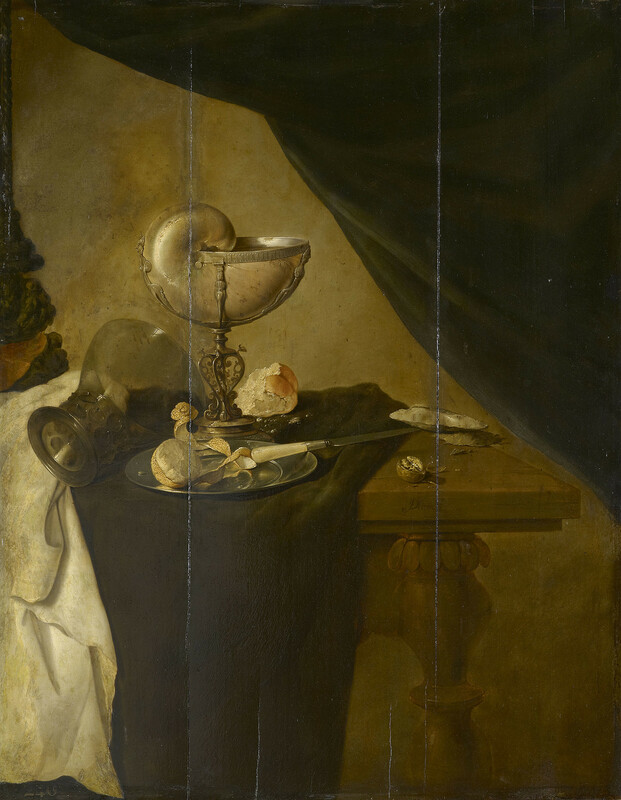 Placed in front of this is a pewter dish upon which sits a bone handled knife and a half peeled lemon; behind some bread, a broken walnut and oyster shell. An element of narrative is suggested by this partly finished repast; who has left off peeling the lemon and consuming the bread and oyster?